Reading and share top 3 famous quotes and sayings about Rare Pearls by famous authors and people. Browse top 3 famous quotes and sayings about Rare Pearls by most favorite authors. 1. "That same night, I wrote my first short story. It took me thirty minutes. 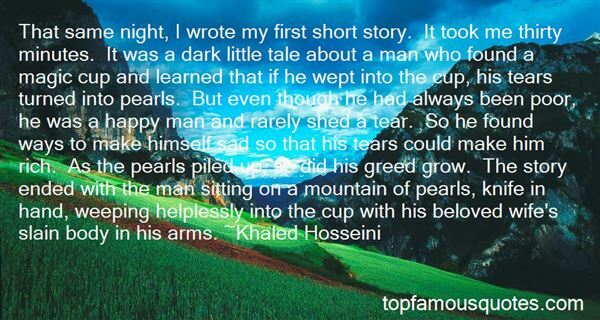 It was a dark little tale about a man who found a magic cup and learned that if he wept into the cup, his tears turned into pearls. But even though he had always been poor, he was a happy man and rarely shed a tear. So he found ways to make himself sad so that his tears could make him rich. As the pearls piled up, so did his greed grow. The story ended with the man sitting on a mountain of pearls, knife in hand, weeping helplessly into the cup with his beloved wife's slain body in his arms." 2. 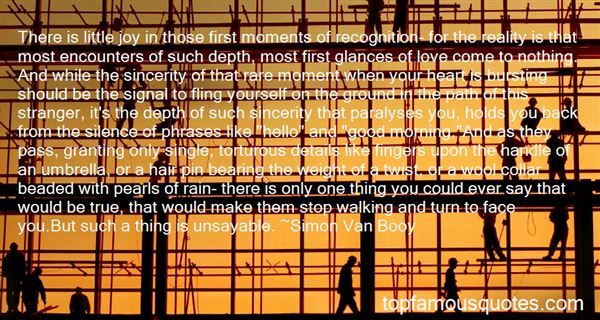 "There is little joy in those first moments of recognition- for the reality is that most encounters of such depth, most first glances of love come to nothing. And while the sincerity of that rare moment when your heart is bursting should be the signal to fling yourself on the ground in the path of this stranger, it's the depth of such sincerity that paralyses you, holds you back from the silence of phrases like "hello" and "good morning. "And as they pass, granting only single, torturous details like fingers upon the handle of an umbrella, or a hair pin bearing the weight of a twist, or a wool collar beaded with pearls of rain- there is only one thing you could ever say that would be true, that would make them stop walking and turn to face you.But such a thing is unsayable." 3. "I heard voices outside our front door - a woman's, bright as polished brass, and a man's, low and dark like the wood of the table I was working on. 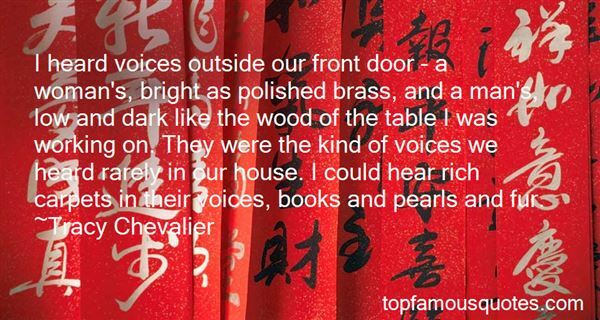 They were the kind of voices we heard rarely in our house. I could hear rich carpets in their voices, books and pearls and fur." We walked away from all that was warm and dear and stood frightened in cold rain where the guns fired, and in the end, we died in pain, the black stinking mud our shroud, embraced at last not by living arms, but by the bones of those who before us died …"